Aaron´s oldest son joined us today to try and catch his first Black Marlin. 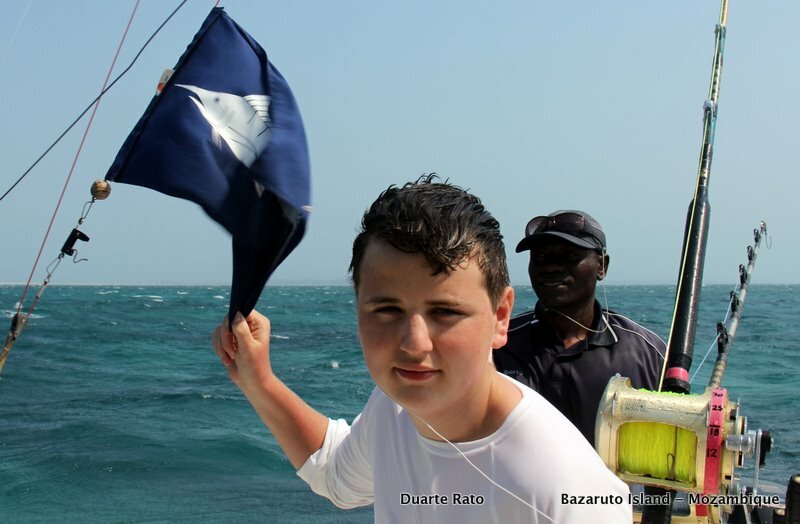 At 13 years of age André as already got a sailfish, striped Marlin and an elusive spearfish under his belt. Knowing that a big southeasterly would move in at noon today we knew would be forced to cut the day short and I worked south so that I could tak with the wind when the front moved in. We had a slow start with only a mysterious strike on the long rigger lure. We then found a finger of good water south of II mile and worked shallower where we found some yellowfin tuna. We had a quadruple strike but the sharks quickly moved in. We then tried to live bait one but again it was sharked within 5 minutes. At about 11 the wind started pushing quiet strong anda n hour later it was gusting 20 + knots. The sea was on it´s head and I slowly started tacking north to got to the top end of II mile to make our way back. At 12h45 the unepected happen. We had a strike and a hookup on a Marlin, but not on the big rods but on the small TLD 25 / 30 pound line bait sticks. We now had 30 knots of ravaging wind and a Black Marlin on the end of a bait rod…this was going to be fun! It was only a 100 pound rat but it did put up a good fight and lost of work for young Andres, who did a beautiful Job. Driving the boat in the big swell was no easy Job, especially trying to get on top of the fish when it come to the surface. Eventually after 50 minutes of Great fun we got it by the boat and let it go…it was so rough we could not take pictures. Bazaruto delivers again…this for a teenager 4th species of billfish!!! The day’s adventure did not end there and on the way back we saw this dhow battling the wind. When we got closer they all started waving frantically and it was a dhow with no wind or engine that had been caught in the wind. There were 6 local kids on the boat, the oldest probably about 12. They were obviously unable to row against the ragging wind and were being pushed away. 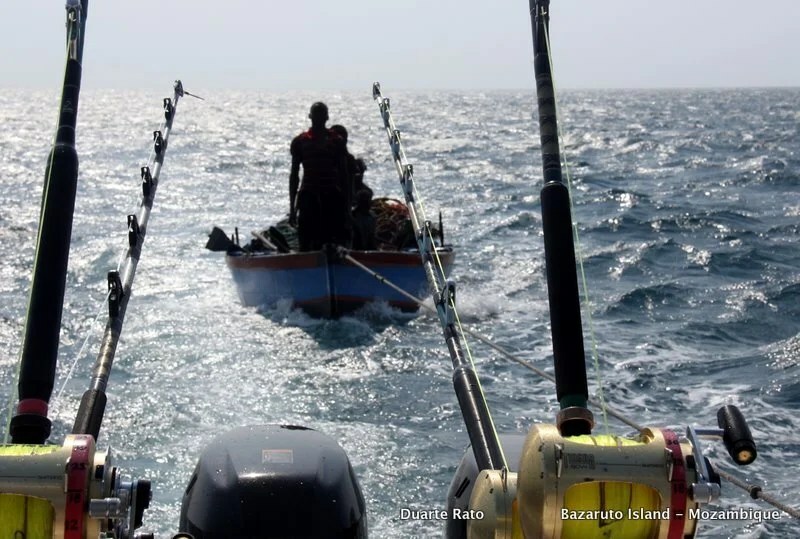 Crazy stuff man, we obviously towed them back to the Island but not without making sure my deckhand Alberto, gave them an earful for being out there when it was so obvious this front was coming. 500 pound Black Marlin for 17-year-old Billy Brake by Captain Duarte Rato!